I love my new Anti-Fatigue Mat! It's so plush. It feels wonderful to stand on. If you've never had an Anti-Fatigue Mat I strongly recommend getting one. 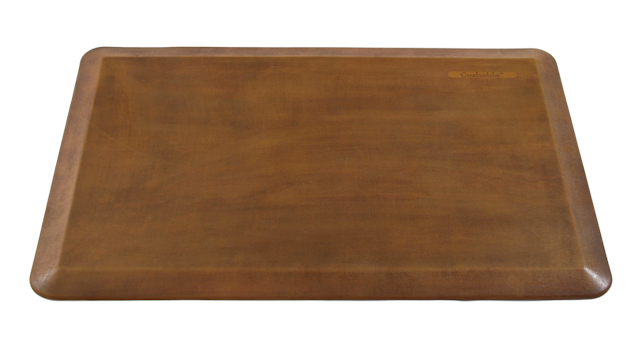 Who should have an Anti-Fatigue Mat? They are great for someone like me that has weak ankles. They are awesome for people like my mom that had Polio. People like my Aunt Becky that have had full knee replacements would love an Anti-Fatigue Mat. They rock for people like my husband that has a bad back. 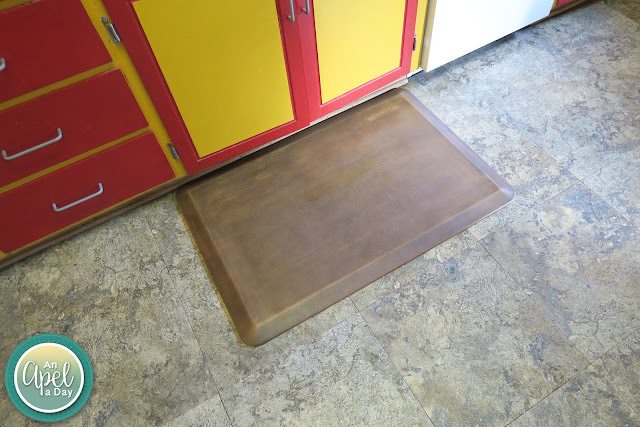 Anyone that's in the kitchen a lot like I am could use a mat like this. People that have standing jobs; where they are in the same position for long periods of times should use a mat like this. Some examples include: A baker, a bank teller, a factory worker, a metalsmith, a hair dresser, and a framer. There are many more jobs like this. It reduces pressure on your feet and knees by up to 40%. This helps with body fatigue. It has a thick foam that is high-grade that feels wonderful to stand on with or without shoes. Just don't wear high heels on it. High heels aren't good on these mats. They dig into them. This mat is 24" x 36". It's waterproof and easy to clean. Each mat is a solid one piece with no laminate to ensure it to last long! I've had other mats that were laminated, and started to break apart. I'm super excited that this mat is one piece! It's non-slip and non-toxic. It moves if I move it. It won't move if you're stepping onto it, dancing on it, or standing there. It is tapered on the edges, so people like my Mom that had Polio doesn't trip. Having a mat like this scared my mom. That is until she saw the edges, and how they taper off. Now I know what to get her for Christmas. 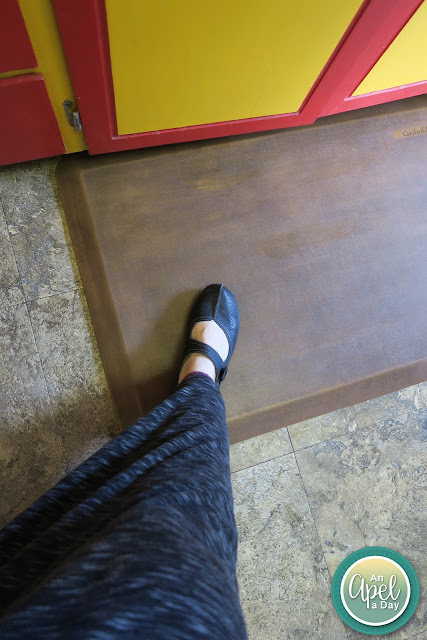 The antique brown mat that I got to review costs: $89.99 and is on sale for $39.99. They also have a black mat that costs: $74.99 and is on sale for $35.99. Both color options can be shipped with Amazon Prime. Free shipping! It came in a big box, and was wrapped in plastic to ensure nothing happened to it during shipment. It is nice that it comes in two color options for each person's decor. I suppose they could add a few colors to the mix to have even more variety. If they had a red one I'd buy it. I could also see a mustard yellow color in my kitchen. I happen to really like the brown because I think it shows less dirt than the black might. I do find that I have to clean my mats often. When I'm canning. It's a 1/2 day to all day event. When I'm making holiday cookies. I make a lot to take to work, and sell at the boy's holiday concert for school. When I'm hand washing a sink full of dishes. Usually I've been in the kitchen for awhile cooking, or baking. When it comes to doing the dishes I'm kind of done with standing. When I'm over a hot stove for a long length of time. 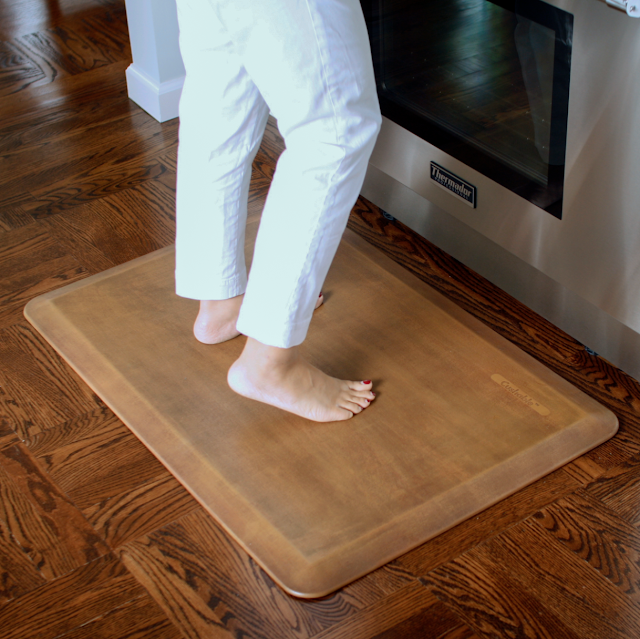 Do you have an Anti-Fatigue Mat in your house? Have you ever worked a job where you had to stand in one place for long periods of time? Disclaimer: I received this Anti-Fatigue Mat for a discount for the purpose of this review. They are so great for in front of the sink. I got one for my mom and she loves it, though the dog often confuses it for his potty training pads and will pee on it. Thankfully, these are easy to scrub down! I like that it's tapered on the edges. I'd try one. My feet get tired after standing up on them all day. It'd be nice to relax them while I'm at the sink. I was just telling marc we need one of these for our sink.